Plato has a wealth of features for classifying data. Each database can contain as many classification schemes as you want. This is not only useful itself, but allows you to analyze data for multi-dimensional clustering --a powerful research and organizing tool. In Plato's terminology, classification schemes and called category families; each classification within a scheme is called a category. The screenshot below is a view of an ethnographic database developed from the original research of John Swanton of the Jessup North Pacific Anthropological Expedition of 1897. 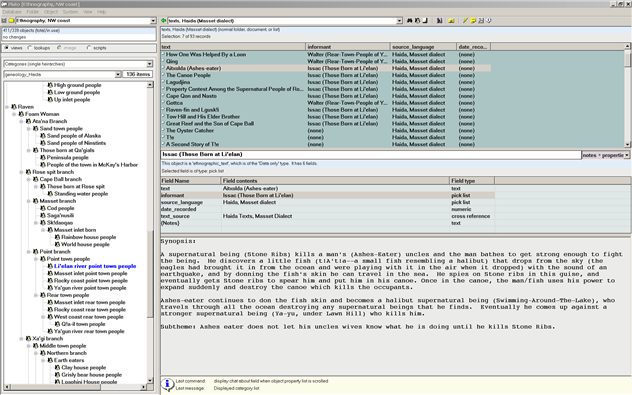 In this view the folder list (top right potion of screen) shows a list of Haida stories and some of their attributes, such as language dialect, informant, and date recorded. Items in this story list are additionally classified by Haida clan genealogy, supernatural deities, and theme. These classifications have been recorded simply by linking the appropriate classification (hierarchical list at left of screen) to the currently selected item in the folder list using the mouse. Once linked in the manner, you may scroll down the folder list and the classifications for the selected item will be highlighted in blue.